Ανακαινισμένο το , το Atlantic City Hotel εγγυάται στους πελάτες του μια ευχάριστη διαμονή είτε βρίσκονται στη Bandung για δουλειά ή διασκέδαση. Σε απόσταση μόνο 3 Km από το κέντρο της πόλης, οι επισκέπτες βρίσκονται στην κατάλληλη θέση για να απολαύσουν τα αξιοθέατα και τις δραστηριότητες. Με την βολική του τοποθεσία, το ξενοδοχείο προσφέρει εύκολη πρόσβαση στους προορισμούς της πόλης που πρέπει οπωσδήποτε να δείτε. Με τις υψηλού επιπέδου υπηρεσίες και την μεγάλη ποικιλία ανέσεων, το Atlantic City Hotel δεσμεύεται ότι η διαμονή σας θα είναι όσο πιο άνετη γίνεται. Κατά την διαμονή σας σε αυτό το υπέροχο ξενοδοχείο, μπορείτε να απολαύσετε τα 24ωρη υπηρεσία δωματίου, δωρεάν WiFi σε όλα τα δωμάτια, 24ωρη φύλαξη, ημερήσιος καθαρισμός, υπηρεσία ταξί. Οι πελάτες μπορούν να επιλέξουν από 100 δωμάτια καθώς όλα διαθέτουν μια ατμόσφαιρα απόλυτης αρμονίας και γαλήνης. Εξάλλου, το ξενοδοχείο διοργανώνει πολλά ψυχαγωγικά δρώμενα έτσι ώστε να έχετε πολλά πράγματα να κάνετε κατά τη διαμονή σας. Το Atlantic City Hotel είναι μια έξυπνη επιλογή για τους ταξιδιώτες στη Bandung προσφέροντας κάθε φορά μια ήρεμη και ήσυχη διαμονή. The hotel just not too far from Bandung train station, staff are friendly, room is clean ( they clean your room, change towel and bed sheet every day), the buffet breakfast has lots of choices. Over all good value for your money and recommended place to stay. Good location hotel, very near from pasteur gate. Easy to find food and near to shoping mall. Property was ok but not to good in maintaining. Our room was on the third floor, with windows overlooking the busy intersection of Padjajaran and Pasirkaliki street, which I liked. The size was kind of small, but at least not claustrophobic. The lighting was also nice so the room did not feel murky at all. However, dust was still found underneath the coffee table and bed, and bed sheets had some small stains. The bathroom was also small and the shower area was so cramped. Rainshower would be better repaired. The location was amazing. I didn't have to walk far to grab some coffee at Starbucks or enjoy some fried chicken at KFC. For a vegan option, Kehidupan is only 5 minutes away from the premises. Overall, I enjoyed the stay. Location is good, room average and the bathroom is just ok. The only run down is the noise of all transportation as the hotel is situated next to the main road. KFC just next to the hotel and it’s open 24 hours. Walking distance to the mall nearby. The room needs to be vacuum, because the dust is too visible and also the hot water wasn't working in the morning. you need to check the machine. but overall, i like the room, the location is close to Mall. 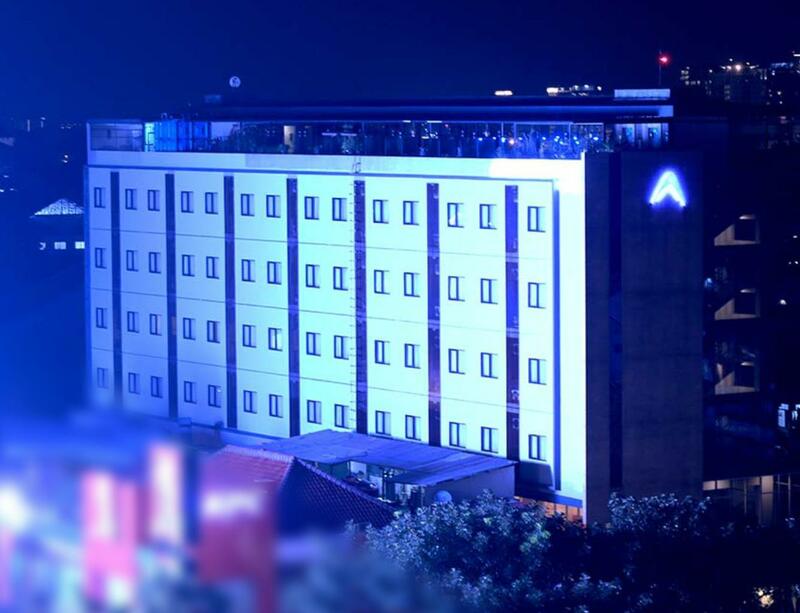 Atlantic City Hotel has strategic location in the heart of Bandung City.. I really love this hotel since its only walking distance to shopping mall Istana Plaza.. if you are looking for food, KFC, Richeese, Starbucks, etc are besides this hotel.. Even the parking lot is small, but free valet service from this hotel really help me a lot.. Note: there is no bath tub for superior room (as that is shown in the photo for superior room) and no hair dryer as well.. Wifi is quite good in the room.. If you take the train, it is very reachable with angkot. You can ask the information staff at station which angkot should be taken. Better not to take taxi. Expensive for a very short trip. Except if you want to take the taxi from outside the station. The hotel itself was quite new. The room and the bathroom are not too spacious but still can move freely. A tips from me, don't forget to ask additional floor towel for the bathroom. If you don't get the breakfast, don't worry. A KFC store is just a few step from the hotel. And for dinner, a lot of nite bite available nearby. It's a simple boutique hotel but service given by the staff were excellent.Smile can be seen at all times from the security up to the counter staff.Location was good just opposite Istana Mall and fast food restaurant like KFC is within the vicinity.The only setback was the shower drainage in the room.It didn't function properly and as such water was overflowing in the toilet... Overall I like this hotel and will definitely be back again. The rugs and carpets are all filthy. The bathroom is dirty. The washbasin is completely clogged. The parking lot is good only for a handful number of cars. I had to park my car in the mall opposite the hotel. The vegetarian stall Kehidupan Tidak Berahir just a round the corner. The breakfast have three food written on the board daily that you can order and ask them cook vegetarian. If you consume allium almost all the food are consumables. They serve vegetables fried rice(contain spring onion), mix vegetables, bean curd and Tempe, porridge, fried pineapple, fried banana, fried bean curd, fried vegetable crack( contain onion), bread and salad. Of course some day they will change some of the dishes. So you need to check it out with the counter. I stayed 1 night in this hotel, I booked a king bed but I got a twin bed because the king bed was full booked by the wedding guest. The room was clean and spacious, but the toilet was tiny. I like the breakfast, there are many variety of food here. Overall, this hotel was good for staying for 1 night. Pros: The location is near Istana Plaza mall just a step away. Easy to find place to eat. value for money. Cons: the staff is not too friendly. our room was on the 5th floor, the hallway carpet on the 5th floor is damaged. not enough lighting in the room. there were no hanger in the bathroom.. they put towel above toilet in a difficult range even for adult. our room was noisy.. i'm not sure whether it's the sound of trains or airplane. nice clean room. good location. it would b great if they can tidy up a little bit on the hallway. the hotel is big, the room are clean, but the security in the parking lot not as friendly as it should be, overall it's a good experience to stay at this hotel. thanks a lot! Σιδηροδρομικός Σταθμός Bandung στα 1.01 χλμ.